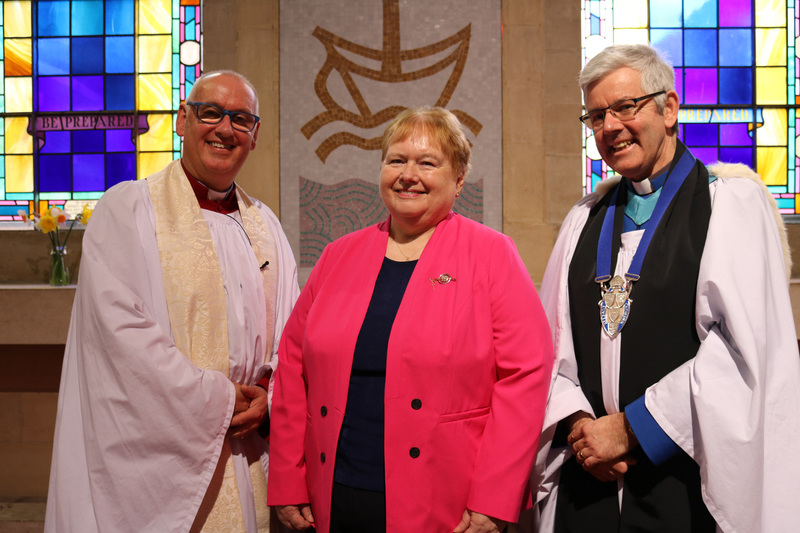 Mrs Sally Cotter was commissioned as the new Diocesan President of Connor Mothers’ Union at the annual Festival Service in Belfast Cathedral on Sunday 7th April, 2019. Banners for all Mothers’ Union Branches in Connor Diocese were carried in procession and presented to the Diocesan Chaplain before the service. They were also carried out again in procession at the end. Sally Cotter has been a member of Mothers’ Union for many years. Sally is a former primary school teacher and has been a member of Mothers’ Union since 1989 holding posts at all levels. Her first branch was St Nicholas, Carrickfergus, where she was branch young members’ rep; area education rep. She was on the Prayer and Spirituality Unit and in 1996 was appointed Diocesan Marketing Co-ordinator. In 2001 Sally became All-Ireland Marketing Co-ordinator. In 2007 she was appointed to the Marketing Unit Committee at Mothers’ Union headquarters in Mary Sumner House. The couple met when they were both singing with the St Anne’s Cathedral, Belfast, Evening Choir in 1979. Sally was organist in First Lurgan Presbyterian Church for five years and in Holy Trinity Parish Church, Woodburn, for 13 years. She currently plays in Donegore Parish, and has been a church organist for 30 years. Sally has been a trustee of Carrickfergus Home Start for 20 years. She has also been a Sunday School Superintendent and a Girls’ Brigade Officer. Sally taught in King’s Park Primary School in Newtownabbey for 31 years before taking early retirement. She and Bob have one son, Christopher. She succeeds Mrs Valerie Ash as Connor Diocesan President.